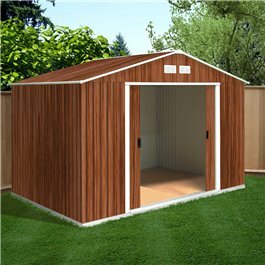 BillyOh SHERWOOD Premium Metal Garden Shed, MAINTENANCE-FREE Steel Sheds, clad in stunning WOODGRAIN finish with white trims. The Billyoh Sherwood Premium Metal Garden Shed, there is ventilation through front and rear vents. Comprehensive assembly instructions and fixing kit is included. Our community of gardeners have a wealth of experience, beautiful garden and great photos, discover more on the following pages: storage ideas, shed ideas. * Support Grows on You when you shop via the Garden Centre.